Our first Mystery Bridge of 2017 takes us back to Saxony in eastern Germany, and in particular, this bridge. This unusual structure spans the Chemnitz River at Hauboldstrasse, roughly 100 meters south of the Müllerstrasse Bridge in the northern part of Chemnitz. This was discovered while bridgehunting and visiting the Christmas market this past Christmas and is considered one of the most unusual bridges I’ve seen so far. The bridge features a rigid Luten arch span, but the piers are engraved into the abutments, The east end appears to have the characteristics of a concrete arch bridge, yet the west end has piers that eventually curve to go vertically into the water, like a timeglass. Such piers can be found with the new I-35W Bridge in Minneapolis, when it was constructed in 2009. The bridge’s length is about 70 meters with a width of only five meters, barely wide enough for car to cross. More unusual is the thickness of the concrete and Art Greco design on the top railings. Most concrete bridges built today depend less on concrete and more on steel for supports making them slender in design, but also safer for cars, pedestrians and cyclists to cross. Engineers went out of their way to carve some unusual artwork with this bridge, using as much concrete as possible- even for its third unusual feature, the portal. The portal itself can be found only on the east side overlooking the city center. It has a hexagonal design that is halved, resembling either a basketball high-top or high heels turned upside down, pending on how you look at it. The bridge is open to pedestrian and bike traffic connecting an industrial area to the west with the neighborhood to the east. Unusual about this setting is there is not much of both, for much of the former is to the north. One needs to follow the smokestack of the regional power company and take about 15 minutes to get there. The latter still has scars from World War II for much of that area has open lots where houses once stood before the war, creating an empty eerie scene while biking towards the city center. Those that are still standing have been renovated to make it liveable and more accessible for handicaps, while having reintroduced vintage lanterns either of sodium or gas-powered. It is possible that the bridge may have been built in the 1990s to provide access to the neighborhood and make it more accessible and attractive. On the other hand, having the Müller Strasse Bridge to the north, with four lanes of cars, plus additional lanes for bikes and pedestrians, it is possible that the pedestrian bridge was built much further back- between 1930 and 1960, which was later supplanted by the current crossing, but was left in place, as people used it more often as it is part of the local bike trail. Given the wear and tear of the structure, my hunches are that it was a product of the East German bygone era that has survived the test of time to date. Smokestack of the Regional Power Company located north of the bridge. But what do the locals think about this bridge? When was it built? Which engineer dated a woman with high heels and was inspired by her to build this bridge? What else do we know about the bridge’s history? Use the contact form and feel free to add some information in German as well as in English. 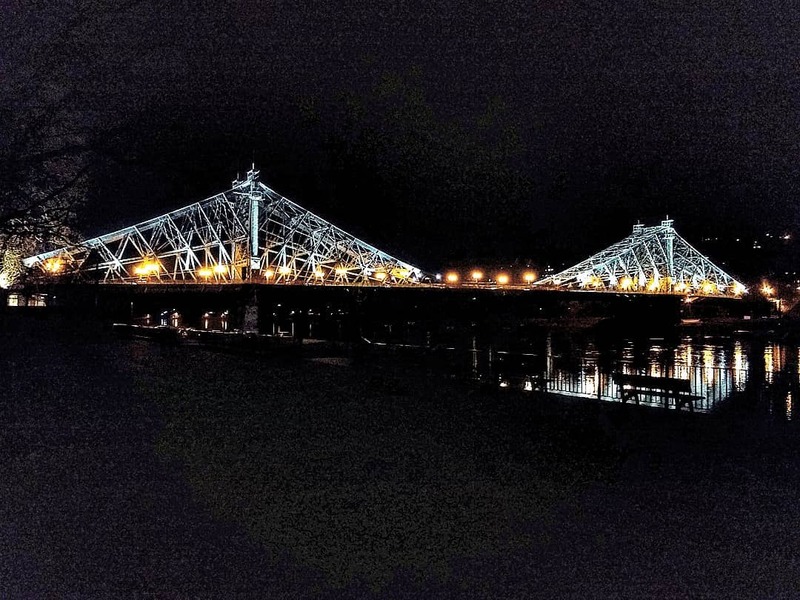 As we know more about the bridge, it will be added to the tour guide that is being put together on Chemnitz’s bridges, a project that just started a few weeks ago and will continue during the first quarter of the year. Let’s see why the bridge is like it is, shall we? Chemnitz is also home of the iron viaduct, which I wrote about back in 2015. The bridge is still standing despite attempts by the German Railways to push through with demolishing and replacing the 1884 structure with a modern one to accomodate InterCity trains. More on the article here. 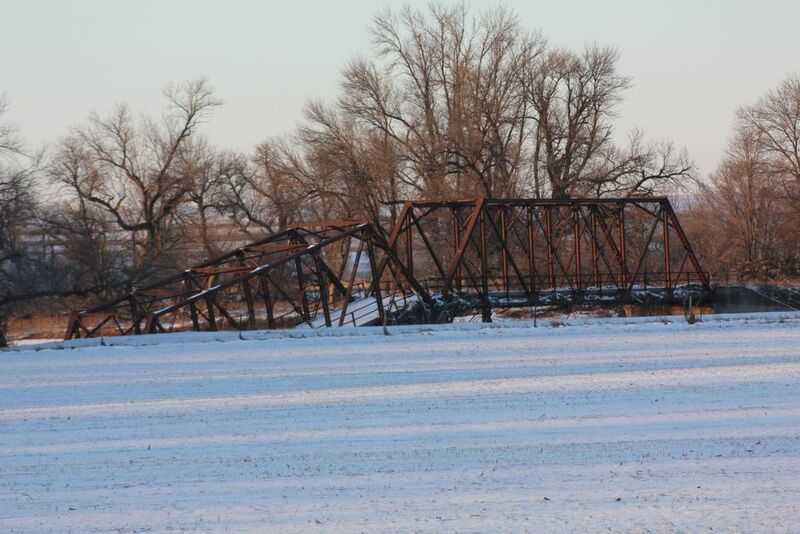 Details and updates on the bridge’s situation will follow. This category was the most exciting and nerve-racking as we saw a battle for first place take place among three candidates: The MacArthur Bridge in St. Louis (Taken by Roamin Rich), Bull Creek Bridge in Kansas (Taken by Nick Schmiedeler) and the Paradiesbrücke in Zwickau, Germany (Taken by Michael Droste). Despite Zwickau’s early lead in the polls and regaining the lead for a couple days a week ago, MacArthur Bridge won the voting arms race with 38.5% of the votes, outlasting Bull Creek, which received 28.2%. Paradiesbrücke got only 16%. 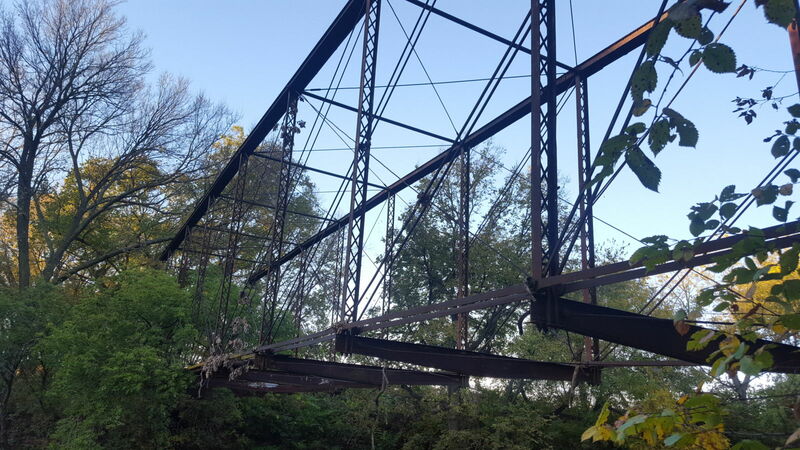 Devil’s Elbow Bridge in Missouri received 4.2% with fifth place going to the same person who photographed the Paradiesbrücke but in the daytime (2.2%). The remaining results can be seen here. For the next three months, the winner of the Best Photo Award will have his photos displayed on the Chronicle’s areavoices website (here) and the Chronicles’ facebook page (here), second place winner will have his photo on the Chronicles’ facebook group page (here), and the third place winner on the Chronicles’ twitter page (here). All three will also be in the Chronicles’ wordpress page (here), rotating in gallery format in the header.